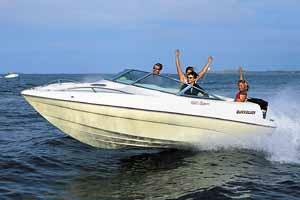 Boat Description The 620 Sport, a quick and modern runabout, is ideally suited for water-skiing or fast cruising. The spacious cockpit provides seating for 6. A cosy cabin permits overnight stays. The 620 Sport is available with either outboard or sterndrive power. A canvas convertible top is part of the standard equipment. Engine Notes Available with either outboard or sterndrive power.